“Our study investigated the effects of systematic musical training on the main components of the attentional system. Our findings demonstrate greater inhibitory attentional control abilities in musicians than non-musicians. Professional musicians are able to more quickly and accurately respond to and focus on what is important to perform a task, and more effectively filter out incongruent and irrelevant stimuli than non-musicians. In addition, the advantages are enhanced with increased years of training,” explained lead investigator, Paulo Barraza, PhD, Center for Advanced Research in Education, University of Chile, Santiago, Chile. The attentional system consists of three subsystems that are mediated by anatomically distinct neural networks: alerting, orienting, and executive control networks. The alerting function is associated with maintaining states of readiness for action. The orienting function is linked to the selection of sensory information and change of attentional focus. The executive control function is involved both in the suppression of irrelevant, distracting stimuli and in top-down attentional control. 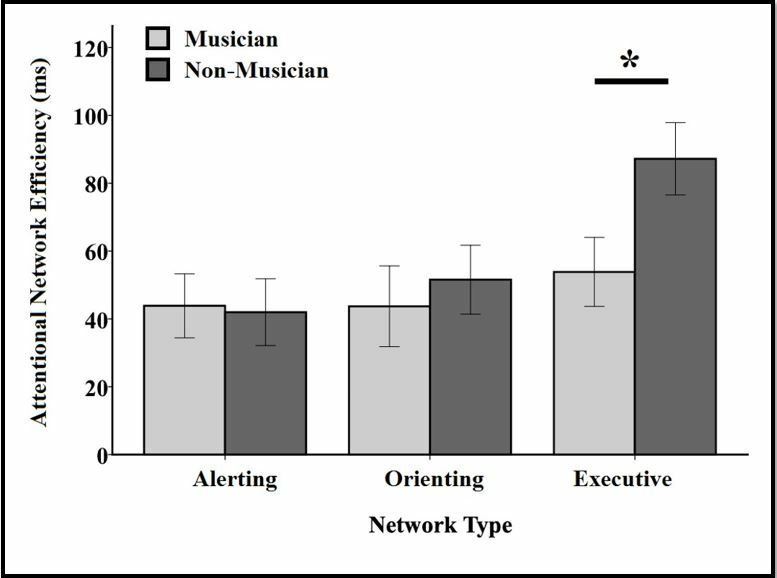 The study’s findings also demonstrated a correlation between the alerting and orienting networks in musicians than in non-musicians, possibly reflecting a functional relationship between these attentional networks derived from the deliberate practice of music. The investigators recorded the behavioral responses of 18 professional pianists and a matched group of 18 non-musician professional adults who engaged in an attentional networks test. The musician group consisted of full-time conservatory students or conservatory graduates from Conservatories of the Universidad de Chile, Universidad Mayor de Chile, and Universidad Austral de Chile, with an average of more than 12 years of practice. “Non-musicians” were university students or graduates who had not had formal music lessons and could not play or read music. Musicians (light gray bars) demonstrated more efficient control at suppressing irrelevant and distracting stimuli (executive control network) than non-musicians (dark gray bars). Note that for the executive system, the higher scores show less efficient inhibitory attentional control. Prior research has shown that systematic musical training results in changes to the brain that correlate with the enhancement of some specific musical abilities. However, musical training not only enhances the musical auditory perception, but also seems to have an impact on the processing of extra-musical cognitive abilities (e.g., working memory). According to the investigators, this is the first study to test the effect of musical training on attentional networks, which adds to previous research about the potential effect of musical practice on the development of extra-musical cognitive skills. “Our findings of the relationship between musical training and improvement of attentional skills could be useful in clinical or educational fields, for instance, in strengthening the ability of ADHD individuals to manage distractions or the development of school programs encouraging the development of cognitive abilities through the deliberate practice of music. Future longitudinal research should directly address these interpretations,” noted co-investigator David Medina, BMEd, Department of Music, Metropolitan University of Educational Sciences, Santiago, Chile. The article is “Efficiency of attentional networks in musicians and non-musicians,” by Paulo Barraza, PhD, and David Medina, BMEd (https://doi.org/10.1016/j.heliyon.2019.e01315). The article appears in Heliyon volume 5, issue 3 (March 2019), published by Elsevier. In online coverage of this paper, please mention the journal Heliyon and link to the paper at https://www.heliyon.com/article/e01315. This research was supported by the Associative Research Program of CONICYT under Grant Basal Funds for Centers of Excellence FB0003; the program CONICYT PAI/Academia under Grant 79130005; and the Grant FONDECYT 1170145.